As a Podcaster, the quality of the Podcast microphone you choose will determine the quality of your voice recordings. While there are many moving parts of a podcast setup such as an audio interface, mixer, compressor, and a computer where the sound is recorded and stored for future editing, the microphone is the fundamental part of any podcasting setup as the audio input has to be of certain quality to be able to improve with post editing. If you are creating a Podcast, keep in mind that you will need a microphone that can focus on small areas (most especially the sound from your mouth), for this reason, an in-built microphone in your laptop or smartphone is not ideal for podcasting because it can pick up external noises within the room, A podcast microphone has a dedicated mic that automatically filters away background noises. A good microphone doesn’t have to cost a fortune. However, you must be careful of choosing extremely cheap ones. Therefore you need to strike a balance between cost and quality when buying one. A studio quality microphones usually cost hundreds of dollars, but you can still find a great one for much less and still get great value out of it. Depending on the type of Podcast microphone you choose, there can be up to five main components of any Podcast microphone. A typical USB Condenser microphone comes with major components; The Mic preamp, The USB Sound card, the enclosure, and the microphone itself. Extra components that can be found on a podcast microphone include; a mixer, the compressor and an audio interface. 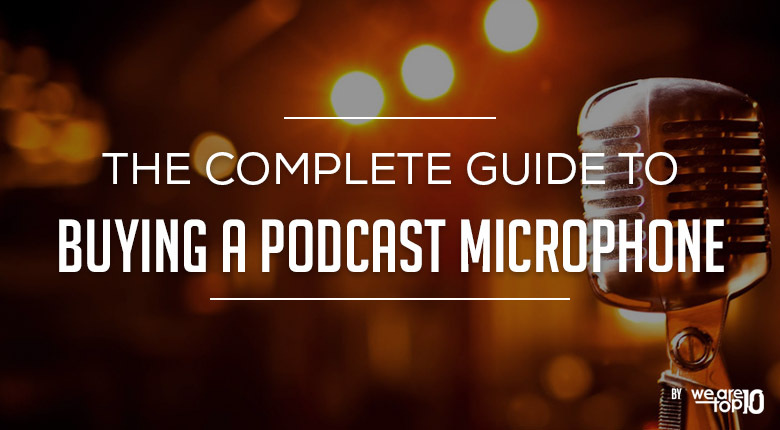 Other extra components you can found on Podcast microphones include; anti-shock mount, and pop-filter. An ideal podcast microphone will provide a smooth frequency of around 16-bit and between 44-50 KHz resolution to produce a smooth and professional quality audible sound, regardless of what you are recording. USB Condenser microphones seem to be easier to handle because it involves a plug and play set-up. Podcasters, musicians, and students prefer this type of microphone because they are cheaper but better than their computer’s in-built microphones. Directionality is a critical factor to consider when choosing a podcast microphone. A microphone’s directionality explains how it picks up sounds from any direction. Some microphones are capable of picking many sounds from different directions at the same time, while most microphones are limited to the direction from which they can pick up sounds, and you can use this limitation to your advantage when making your recordings. Omni-directional: Omni-directional microphones are capable of picking up sounds from virtually any direction, therefore, they are capable of picking up unwanted noises. For this reason, you should consider buying these types of microphones if you are reporting or broadcasting, never consider these microphones for personal podcasting. Bi-directional: Bi-directional podcast microphones refer to a group of microphones that can pick up sounds from opposing sides. These types of microphones are not quite popular with podcasting but are not popular with amateur music recordings. These microphones can cost hundreds of dollars. Thus they remain some of the most expensive podcast microphones in the market today. Cardioids: Cardioids are heart-shaped microphones that only pick up sounds from the front direction (Especially the direction to which the microphone is pointing at), this microphone can also pick some little sounds from the sides. Cardioids remain the most popular types of microphones used in recording music today, and it belongs to the Condenser-USB type of podcast microphones. Shotgun: Shotgun microphones are unique as they feature a highly directional, cardioid polar pattern yielding great attenuation at the sides of the microphone, maximizing pick up at the front. While a lot of videographers use this by mounting on their DSLR, it has the best signal-to-noise ratio which produces the most accurate sound that it picks from the front. The impedance of Microphones is another factor you must consider when buying a podcast microphone. Impedance refers to the receptiveness ability of a microphone, especially to a sound signal or AC current. The Impedance of a microphone is measured in Ohms. If you want the best Podcast microphone, you should consider a mic with an Impedance rating of 600 Ohms or lower – these have better audio retaining qualities especially when you are using cables longer than 16 feet. You need to check the Impedance rating of a microphone before buying it because a very high Impedance rating may signal the poor quality of other components of the microphone. Frequency Response of Microphones Most podcast microphone manufacturers will clearly display the frequency response of their products on the package labels. Simply put the range of frequencies at which a microphone can detect audio sounds is its Frequency response. Knowing the frequency range of the microphone is not as important as knowing the specific frequencies at which your microphone will respond to sounds, for this reason, you need to think about what you are recording before picking up a microphone. If you are recording vocals and guitars, then you should pick a mid or high range frequency response, and if you are recording for bass, then you should consider a low-frequency response. The durability of Microphones Durability is another factor you will definitely consider when purchasing a podcast microphone. Condenser-USB microphones are complexly designed, and for this reason, any shock or drop may damage the microphone. The internal structure of condenser microphones also shows that they are generally more expensive than dynamic microphones. Therefore it will be wiser to invest in a heavy-duty microphone like a Dynamic microphone if you are prone to dropping or abusing microphones. Price of Microphones Price should be the last factor you should consider when buying a podcast microphone. Dynamic microphones seem to provide great value for money, they are sturdily designed and can last for several years when maintained very well. Dynamic microphones may withstand lots of abuses, but once damaged, you may find it difficult to get replacement parts, and on the other hand, USB-Condenser microphones are fragile and can be easily damaged. However, some repairers can provide replacement parts for them. Blue Woodpecker Microphones are the Ribbon-Dynamic microphone that cost as much as $1000, despite their fragility, but the quality of sounds they produce is far better than what you will get from any Dynamic microphone. We have covered the Top 10 Best Podcasting Microphone Reviews by Price. Which type of Microphone Should you Consider Buying? Choosing the right type of Microphone should depend on what type of podcast you are about to create. Make sure you consider the microphone that will give you the ideal directional capability, Impedance and Frequency response (base on the main factors that has been explained above). A dynamic microphone may be more expensive however it can help you record deeper vocals as well as strong percussion instruments, a USB-Condenser mic on the other hand can help you create excellent acoustic sound recordings. A USB-Condenser microphone may also provide a cheaper alternative to a Dynamic mic, if you are working on a very tight budget. Condenser microphones can also help you create better sounds from highly sensitive sources. As a personal podcast microphone user, a simple and cheap Dynamic podcast microphone may be suitable for you if you use it for yourself and not for commercial purposes. If you want a dynamic microphone for commercial purpose, then you should invest a lot more in the high-end Dynamic microphones that can withstand several years of abuses and they do come with special manufacturer warranty. USB-Condenser microphones are highly recommended for individuals who sparingly record podcasts. There are basically two types of Podcast microphones around today; The USB-Condenser, and the Dynamic microphones. While the USB-Condenser microphone requires external power, the Dynamic microphone doesn’t require any and can pick up sounds from a limited source of audio supply (such as your mouth). Dynamic microphones also come with much better compact designs. While condenser microphones require an external power supply, they are able to deliver richer and fuller quality tones which makes it great for podcasting. The third type of Podcast microphones are the Ribbon microphones. Ribbon microphones are technically dynamic in nature because their internal working mechanisms are similar to those of dynamic microphones. Dynamic microphones make use of unique design technologies, they are known for their versatility as well as simple yet sturdy constructions. They come in wider ranges of quality and prices. While some models such as Nady SP-4C can go for $20, high-end brands like Electro-Voice RE20 can cost more than $500. The differences between the sound qualities of expensive high-end brands and the cheaper brands can be very huge. However, the technology used in creating them is more or less similar. Dynamic microphones can be described as mini-loudspeakers that however work in reverse (in this case, sound waves are converted into electrical impulses). In a typical dynamic microphone, there is a wire coil located close to a magnetic component, sound waves simply vibrates when they hit the wire coil, and when the magnetic component is activated, an electrical current is generated, this, in turn, will be directed through a wire, and out of the microphone, into your recording equipment ( your computer for instance). The simple design used in the making of dynamic microphones allows them to withstand more abuse than other types of microphones. Their longevity and durability make them the ideal choice for musicians, and people who record podcasts more frequently. It is important to note that Dynamic microphones are designed to respond to the loudest sounds possible, and this is the reason why they are used at live shows. Dynamic microphones generally cost much less than microphones of similar qualities. Condenser microphones generally have more complex set-up than Dynamic microphones. For this reason, they can produce stronger audio signals. Hence they are more sensitive and more responsive than Dynamic microphones. Condenser microphones are much more preferred when recording subtle sounds. With the sensitivity of Condenser-USB microphones comes certain a condition or procedures that must be carried out. A typical condenser microphone does not contain wire coils; rather it contains two capacitor plates that are powered from an eternal source through a process known as “Phantom power.” The eternal power source is a mixer that is directly connected to the microphone. If you are planning on getting a Condenser microphone, always keep in mind that it’s set up will require that you purchase some extra hardware. Condenser-USB microphones are however much more preferable to Dynamic microphones if you are looking recording sensitive sounds with better frequency response. Ribbon microphones are special types of Dynamic microphones; they have a similar internal design like Dynamic microphones except for the absence of a wire coil. The wire coil in dynamic microphones has been replaced by a single thin ribbon (a thin metal conductor) that is forced to vibrate when it comes in contact with sound waves. Ribbon microphones are quite harder to find these days, and they are very fragile when compared to Dynamic and Condenser microphones. With the inclusion of a thin metal conductor, you don’t have to worry about the microphone being destroyed through the supply of strong blasts of sounds. The microphone is not exposed to any phantom power supply. Therefore it is quite safer to use than Condenser microphones, and however, it is still fragile when it comes to design. Ribbon microphones provide detailed and warm sounds, and this is why they are preferred by musicians. Can I record a podcast on my iPhone? While it may seem convenient, an iPhone is not matched to the studio microphone, either condenser or dynamic and will affect the quality of your podcast. Podcasters do use a digital audio recorder as a backup which you can consider buying. Zoom H1 is a handy backup mic that will save you from a lot of headache when things go down. Do I need an audio Interface to Record Vocals? The audio interface worked as an external sound card and used to get audio in and out of your computer. As you are recording the audio on your computer, a good audio interface will improve the quality of your audio by giving you more control and options that is why podcasters tend to go for external equipment like this to maximize their quality. What does an Audio mixer Do? An Audi Mixer or sound board is another equipment used by top-rated podcasters like Smart Passive Income, and they use it to combine multiple tracks of music into a single track. The Audio mixer provides options like adjusting equalization, audio distribution, and audio level adjustments all use to really get that studio like the sound from a simple setup and small investment.